I had a 12" cerwin vega subwoofer in a 3 cu ft enclosure with a JC whitney amp that was supposedly something like a 4,000 watt amp it was 20 years ago so I don't remember for sure but that set up boomed like you wouldn't believe. My current up I attached the specifics in the attachment and I am trying to figure out what needs to be done to get a system like I had again. The way I have this current system wired is parallel and then using 2 channels. The sub woofers don't have an RMS rating listed. I have hooked it up in parallel and then bridged it into one channel and it overheats immediately. So the current way I have this wired is giving each sub 600 watts at 2 ohms? When I had it hooked up bridged it would have been 1200 watts for each sub at 2 ohms which is why it overheats? If I could get it hooked up bridged at 4 ohms it would be maxed out and work correctly? How can I achieve that? Last edited by punchy187; 08-02-2014 at 03:15 PM. Is this a good match? Amp and sub? 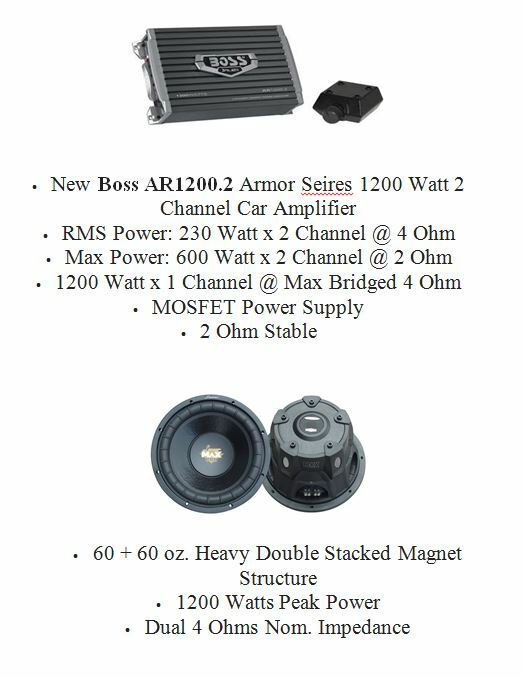 Good sub match for a 500w @ 2Ω​ amp​? is this a good sub to match amp?